Today I´ll do another only Alliance day. I try to level them up, but often forgets as I´m mostly logged in on my Horde server. But it´s time to give them some attention. Xithraz just dinged a level so she´s 26 at the moment and Meldy got a few levels last time and is now a lvl 13 Disc priest. So far Xithraz onlt experience in tanking dungeons was when a Horde guild friend made a new Alliance charater so she could train on healing as a Paladin. That was some time ago and at the moment I´m afraid that I´ll do something wrong when I tank. Errr... On second thought Xithraz is lvl 27. Yeah she just dinged. Again..
That´s her, Xithraz. 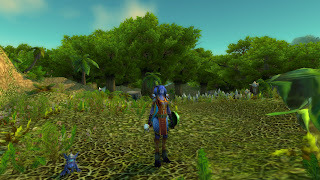 She´s currently runing around in Northern Stranglethorn and doing quests. Hopefuly she will be nearly lvl 40 when the day is over. Getting tired of not having a faster mount. And then I´ll be getting tired of not having a flying mount.. I´m to used having them. Well now she´s halfway to level 28 so soon time to think about her second spec. Not sure if I´ll go with Ret or Holy. Know I can change later, but not sure what I want it to be at the moment. Oh well.. Don´t need to be thinking about it for about two more levels. I´ll update more later today on her progress and hopefuly she´ll be level 40 then.